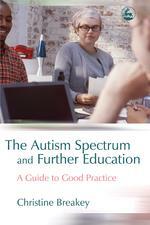 This guide for professionals working with students with autism spectrum conditions (ASCs) in further education meets the increasing demand for information and support on this subject. Christine Breakey provides useful guidelines and practical advice on teaching young adults successfully and confidently, emphasising the development of resources and practical skills for use specifically in FE colleges. The author covers all the key areas and offers strategies and solutions for communicating effectively, helping students to manage transition, and understanding and minimising the causes of ASC behaviours as well as teaching social skills and ASC self-awareness. The Autism Spectrum and Further Education will be a vital resource for professionals in FE institutions who have to meet the needs of young adults with ASCs. Preface. Introduction. 1. Breaking Down Barriers. 2. Which Approach? Ideology, Theory and Practice. 3. Developing an Inclusive Specialist Team. 4. Maintaining an Effective Specialist Team. 5. Staff Training. 6. `Autistic Thinking' and the Need for Adjustments. 7. The `Hidden Curriculum'. 8. Individual Accounts. References. Index.